I have been involved in volunteer communications since I was first licensed because it allows me serve and help others by doing something I’m good at and passionate about. For many years, the Amateur Radio has played a crucial role in civil emergency and disaster communications planning and deployment. Some notable events include the 1979 Mississauga Train Derailment, the 1998 Quebec Ice Storm and, more recently, Hurricane Katrina in 2005. In today’s world of the Internet and satellite communications, high-frequency (HF), or shortwave, communication is considered archaic by many. However, if we were to lose these primary networks, then HF is the obvious backup. It doesn’t require a large infrastructure or massive amounts of power. It allows for point to point communication over great distances with as little as a small 100W transceiver, a 12VDC car battery and a random-length piece of wire for an antenna. Doesn’t that sound like something the military might like to be involved with? In Canada, the Department of National Defence (DND) sponsors a program called CFARS: the Canadian Forces Affiliate Radio System. 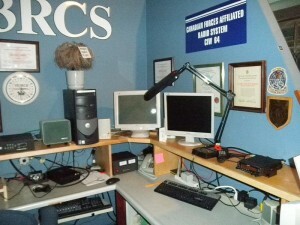 CFARS was initially structured after its American counterpart, MARS – the Military Auxiliary Radio Service, and consists of DND/Canadian Forces installations, Canadian Forces-based amateur radio club installations, and civilian Amateur Radio licensees who have applied and been accepted into the system. CFARS consists of some 125+ stations spread across Canada, as well as several unattended RF-based Winlink e-mail gateways. The purpose of CFARS is to provide DND with a means of establishing and conducting long-distance communication using a system capable of operating independent of established infrastructure. Unlike the Amateur Radio Emergency Service (ARES), CFARS uses frequencies assigned us by DND and Industry Canada that are close to, but outside the established amateur radio bands. This has the advantage of being able to avoid interference that could be suffered should those bands be crowded, and also allows us to avoid intentional interference. Since the assignments are close to what we’re used to using as HAMs, we aren’t required to make any large or costly modifications to our equipment (that’s not to say that we don’t anyways). 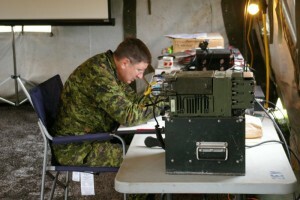 As well as being there to provide auxiliary communications to DND, we’re also used by military trainers to assist in teaching soldiers how to use HF communications in the field as a means of backup communications. Remember those big, bulky, green HF radios with the huge whip antennas men used to carry in the days of WWII? Well the radios are a bit smaller now, but they’re still bloody heavy, and they’re still used by the Allied forces. But using an HF radio is tricky: it’s not as easy as picking up a sat-phone and dialing a number. The use of HF depends on many factors: not the least of which are the time of day, the distance between both communicators, and most importantly, the weather on the sun. The same solar flares and storms that cause the Aurora Borealis cause sporadic or even total blackouts on HF. Some days, I can talk to someone on the opposite side of the Earth using 1W of power (which I could generate using 4 AA batteries). Other days, I need 1kW of power to talk to someone 200km away (which requires an amplifier that plugs into a 220V stove or dryer receptacle). I doubt there’s anyone else that knows as much about HF communications as a seasoned amateur radio operator, and the military takes advantage of that by periodically asking CFARS to join their field training sessions. If any of this has piqued your interest, you can read about the History of CFARS on the CFARS Operations Website. You can also follow CFARS on Facebook. Lt. Col. Dan Bergeron, VE3SEW/CIW603 has also put together a great presentation called Why I Should Join CFARS for those Canadian HAMs who might be interested in applying. I applied to CFARS in the fall of 2014 and my application was granted in February of 2015. My CFARS callsign is CIW601. If you want to listen to what we do, you can use the Live Audio Stream function of this site to listen to one of our weekly formal nets, which occur Sundays at 2200z (in Eastern Time, that 5PM during Standard Time, 6PM during Daylight Savings Time). Still waiting to hear back from Cfars on using the submarine Ojibway ,for over a year now ??? Contact me please, Ve3tlt.